Before applying any facial scrub or mask, make sure you remove your make and clean your skin to allow the recipe to penetrate in your skin. Do not confuse corn meal with cornstarch as the former is simply ground up dry corn, which has a grainer texture than cornstarch. 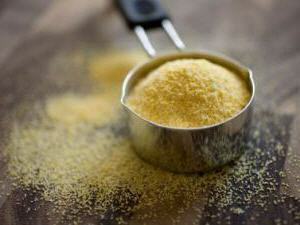 Moreover, cornmeal has a yellowish color whereas cornstarch is white. • Add two teaspoons of aloe vera gel and two drops of sweet orange essential oil in half a cup of finely ground cornmeal. Rub this paste gently on your skin for a couple of minutes. Finally, wash it off with lukewarm water and follow up with a moisturizer. • Prepare a facial scrub by diluting apple cider vinegar in water and mixing two to three tablespoons of cornmeal to form a paste. Scrub your face with is recipe and rinse it off after about 10 minutes. You need not dilute the apple cider vinegar if you have oily skin. On the other hand, if you have sensitive skin, you may add more water. • Scrub as well as moisturize your skin applying a paste prepared by adding one tablespoon each of cornmeal, organic honey, and a few drops of lemon juice in two tablespoons of heavy cream. • Another easy recipe is to combine one and a half teaspoons of cornmeal and one teaspoon each of organic honey and water. Here’s a video showing how to make a cormeal mask with cornmeal, yogurt, and a few essential oils. • You may scrub your hands simply with a mixture of lemon juice and cornmeal to deodorize your hands and maintain soft skin. • Take fresh juice extracted from an orange and mix four tablespoons of cornmeal in it to form a paste. To get the juice, you can cut the orange in two pieces and squeeze the juice instead of using a juicer. Gently massage this paste on your face and neck. Finally, wash your face with lukewarm water. Both the ingredients are great for getting smooth skin. Furthermore, cornmeal exfoliates the skin and orange juice makes your skin glow. This mask is particularly good for aging skin. • When dealing with dry or sensitive skin, apply a combination of one tablespoon each of wheat germ, corn meal, and oatmeal mixed with enough water to form a paste to exfoliate your skin. • In case of oily skin, combine two tablespoons each of cornmeal, plain yogurt, and a teaspoon of lemon juice. Massage this mask on your skin for a few minutes and rinse it off after five minutes. • Add a cup of chamomile tea and a teaspoon of milk powder in a quarter cup of cornmeal. Rub this thin paste on your face and neck. After 15-20 minutes, rinse it off with lukewarm water. Besides, you can use cornmeal to heal toe nail fungus and treat athlete’s foot. For this, you need to take a flat pan (large enough to hold your feet), pour cornmeal in it up to one inch, and cover it another one-inch layer of room-temperature water but do not mix. Keep it aside for about an hour until it looks like mush. Finally, soak your feet in this solution and add more warm water in the pan. This scrub ideas is so good. I will try it this weekend. Cornmeal scrubs have always been good for long.